Music has found a new sound through the beat making of Kenneth Davis also known as K.Black. Born in Trenton, New Jersey it was there Black developed his appreciation for music and his love for producing. With his soulful style and jazzy vibe Black's brings back that Old School feel while keeping his unique and smooth New School flavor with every track. The root of Day One Productions was planted in 1996. Two brothers, Derrick (Legend) and Kenneth (K Black) Davis, decided to turn their technological skills, creativity, and love for music into hip hop tracks. After building their own computer, these New Jersey natives began mastering available production software to create versatile beats that immediately attracted vocalists, spoken word artists, and emcees in both the U.S. and abroad. At the time, in addition to studying information technology and business, Legend was managing a promotional team for new mainstream and underground artists at Howard University, and working in marketing and promotions for Uptown Records and Sony Music. K Black was developing his own production blend of vocal samples with his own drums and instruments to create a unique sound. In December 2008, after over ten years of studying the industry and perfecting their beats, Day One Productions was launched. With Brother Andre Davis (JusInfamous) as Media Manager and Producer Arthur Jones (J-Boogie) added to the team, Day One emerged as a production company for hip hop, R&B, reggae, soul, and neosoul. In 2009, the operations of Day One were expanded to Africa, where Day One partnered with Barick Music to manage the East Africa office in Kigali, Rwanda. The talented team of music producers, artists, and audio/visual engineers of Day One Productions provide underground and mainstream artists an opportunity to train and develop their skills. “Every time she sang that song”, recalled Barney Josephson, a New York nightclub owner, it was unforgettable…I made her do it as her last number…When she sang “Strange Fruit” she never moved. Her hands were down. She didn’t even touch the mike; with the little light on her face. The tears never interfered with her voice, but the tears would just come and knock everyone in that house out. Billie Holiday was born Eleanora Fagan in Philadelphia, Pennsylvania, on April 7, 1915 to teenagers Sadie Fagan and Clarence Holiday. She grew up in Baltimore, Maryland, and became perhaps the greatest Jazz singer ever recorded, a unique improviser and soloist. She set the standards to which future vocalist such as Sara Vaughan, Carmen McRae, and Lena Horne would aspire. Much attention has focused on the tragic and destructive dimensions of her private life, but it is her musical talent that compels interest and admiration. 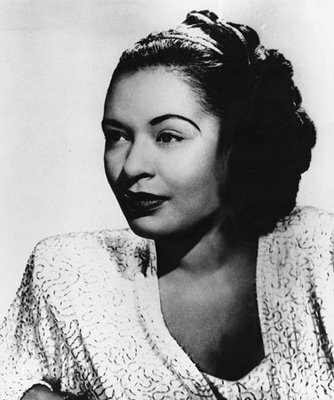 Holiday used her talent to do more than to entertain; she challenged and often disturbed her listeners, especially with her soul-shattering rendition of “Strange Fruit”. While frequently factually inaccurate, holiday’s autobiography, Lady Sings the Blues (1956), and the equally distorted 1972 movie starring Diana Ross emphasize her struggle against sexism and racism within the music world and society. Holiday appeared in two movies. In 1935 she performed in Duke Ellington’s short film Symphony in Black, singing “Big City Blues.” In 1946 she performed three songs in a movie, New Orleans, opposite her musical mentor Louis Armstrong, Saxophonist Lester Young, who began recording with holiday in 1937, gave her the nickname “Lady Day.” By the late 1940s, Holiday’s addiction to drugs was hurting her career. In 1947 she entered a private clinic, but was unable to stay clean; following her discharge, the police arrested her for possession, and she served nine and ½ months at the Federal Reformatory for women at Alderson, West Virginia. New York officials revoked her cabaret card and prohibited her from performing in night clubs in the city. Still, she gave concerts in other cities and went on international tours. A year before her death, holiday recorded her most popular album, “Lady in Satin” (1958). She died in New York City on July 17, 1959. Thousands of friends and fans attended the funeral, a formal requiem high mass held at Saint Paul the Apostle Cathedral. She was buried in Saint Raymond’s Catholic Cemetery in the Bronx. 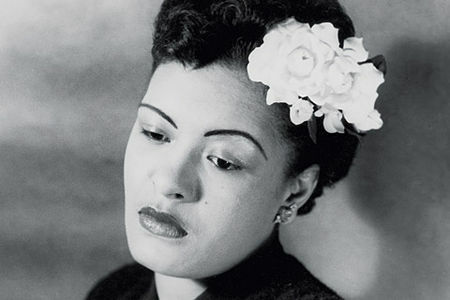 Notes: Billie Holiday (1915-1959) was one of the greatest jazz singers of all time. Between 1935 and 1938, she released some eighty titles on the Brunswick label for marketing to the black jukebox audience.